Leveraging on its first edition’s success Alantra launches the second program of Alantra Emprende, a CSR initiative in which multidisciplinary teams from the company provide strategic and financial advisory services pro bono to three selected startups with the collaboration of the Empresa & Sociedad Foundation. The selected projects for this second edition will benefit from an advisory program that aims to structure the entrepreneurs’ finance model and strengthen its client base. The entrepreneurs that will take part on this second edition are: Alumne, a company that offers online training courses for groups and professionals; Citibox, a website that offers home-delivery services for e-commerces and De Buen Café, a company that introduces your corporate messages on your company’s coffee cups. Julián Cepeda, Partner and Director of Alantra Emprende, said “It’s a project that on one hand generates a significant local social value through the support of the next generation of entrepreneurs, and on the other it allows Alantra to foster key aspects of its corporate culture like knowledge exchange. We are very satisfied to realise that young entrepreneurs value our expertise and that our team of professionals from Alantra consider this project inspiring”. Francisco Abad, founder of the Spanish Empresa&Sociedad Foundation, is in charge of selecting the three local entrepreneurs and the coordination of the teams. He claims that, “Alantra has undertaken an initiative pioneer in its sector which will become an international benchmark. The project is tailor- made for the company’s innovative spirit in order to create value for the entrepreneurial business network”. On its first edition during 1H 2017, the three entrepreneurs that participated on the program were: DecideSoluciones, MeetyourTalent and Imascono. Javier Lafuente, co-founder of DecideSoluciones said that “participating in Alantra Emprende has given more clarity to their project”. He added that “they were too focused on the product, leaving aside the financial and commercial aspects of their business and postponing its international expansion”. On the other side, Alberto Barrio, co-founder of DecideSoluciones, highlights “the generosity of Alantra’s professionals and their promptness when it came to understanding the circumstances and the future’s challenges”. To Fran García, founder of InHours/MeetYourTalent, the members of Alantra Emprende “have been enthusiastic about their project”. During these months, García thinks that “they’ve build a solid and trust-worthy financial model in order to be able to negotiate with investors”. Héctor Paz, co-founder of Imascono, points out that “Alantra has helped them avoid the chaos in which the entrepreneurs live by introducing a working system in their day to day work. “We’ve been able to design different strategies for different products inside one company. We’ve learned to work in a more systematic, focused and coordinated way”. His colleague Peter Lozano adds that “instead of a technical and cold relationship, we´ve established a genuine connection with Alantra”. 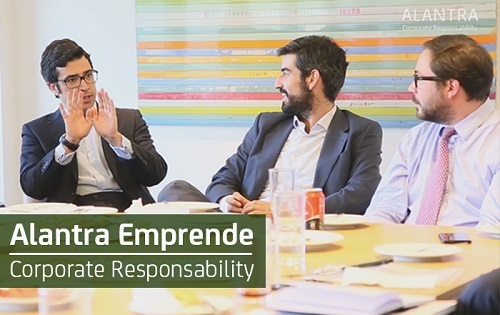 Alantra Emprende is an innovative CSR program that Alantra, together with Empresa&Sociedad, has undertaken in order to provide free advice to selected start-up projects. The project aims to support B2B entrepreneurs, whose business activity is growing but still on its early stages, and provide them with Alantra’s know-how from the multidisciplinary perspective of its different services: strategic advisory, financial advisory, adjustment of its business plan or advisory in order to attract investors. Through Alantra Emprende’s multidisciplinary (Advisory, Asset Management, Investment Banking, Holding, Legal advisory…) and intergenerational (seniors to analysts) working teams, Alantra strives to become a promoter of the future’s business network and to strengthen the company’s corporate values. Click here to go to our Corporate Responsibility web page.